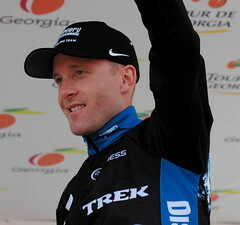 Leipheimer, Contador to join Bruyneel at Astana? In an interview with Levi Leipheimer in today's edition, Salt Lake City's Deseret Morning News reports that Leipheimer and Alberto Contador will follow Johan Bruyneel over to the Astana squad, along with Tomas Vaitkus and former Liberty Seguros and Astana rider Sergio Paulinho. Astana suffered through drug scandal after drug scandal in 2007. 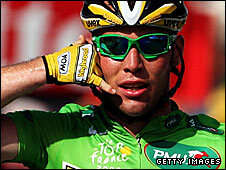 They may see Bruyneel, whose teams have escaped any significant positive tests, as a chance to make a new start for 2008. In other Disco news, George Hincapie has formally announced his 2-year contract with T-Mobile. Coming off a dominant Tour de France performance, the Discovery Channel pro cycling team will announce it has been unable to find a new title sponsor and is disbanding. The announcement comes in the wake of a press conference today where Tour winner Alberto Contador reiterated that he's never used doping products and was not involved in the Operación Puerto ring. 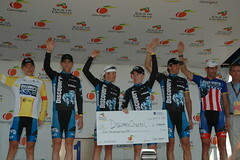 The Discovery Channel team was the only US-based ProTour team, and grew out of the Subaru-Montgomery Sports team created by Thom Weisel in 1989. The announcement will free Contador, George Hincapie, Levi Leipheimer, and the team's other riders to seek alternate teams next season. The team will still compete in the Vuelta a España and the Tour of Missouri as planned. Jonathan Vaughters' Team Slipstream is racing more and more on the European circuit, and has signed a number of ProTour riders, including David Millar, Dave Zabriskie, Magnus Backstedt, Julian Dean, and Christian Vande Velde. 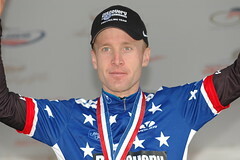 Vaughters has said he hopes to win a ProTour license for 2009. T-Mobile announced yesterday that they will continue sponsorship of the team at least through 2010, when its contract expires, despite continuing doping scandals, including T-Mobile's Patrik Sinkewitz, who tested too high for testosterone in June. In a new interview with Macleans.ca, David Walsh, author of From Lance to Landis: Inside the American Doping Controversy at the Tour de France and chief sportswriter for The Sunday Times, says he's been following the Tour, and isn't sad to see Vinokourov and Rasmussen shown the door. DW: Why is it sad? They’re cheating. It’s sad that they cheat, but it’s good news when they get caught. 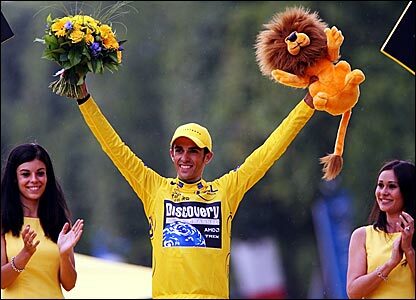 What is sad is that the guy who’s wearing the yellow jersey now, Alberto Contador, is definitely cheating. Walsh, an outspoken critic of Armstrong, believes the teams that are trying to compete clean are “getting screwed, as they have been for the last 15 years.” He briefly discusses how riders get around positives by carefully scheduling drug use, transfusions, and hormones to minimize the chance of being caught. Details how Contador was initially lumped into the Operación Puerto names, but eventually cleared because his name appeared only in non-doping contexts. Michael Rasmussen took full ownership of this Tour de France today, outriding the entire field and pushing his overall lead out to more than 3 minutes on Discovery Channel's Alberto Contador. It looked like Discovery Channel had played their cards to perfection. On the day's last climb, Yaroslav Popovych absolutely slayed an elite group that had been riding with Rasmussen, leaving three Discos in a 5-man group: Popovych, Leipheimer and Contador vs. Rasmussen and Cadel Evans. His job done, Popovych fell away, and Contador and Leipheimer looked to make the race. Each would attack Rasmussen, who repeatedly led the other Disco and Evans back onto the attacker's wheel. Late in the climb, Leipheimer looked cracked, and the field was whittled down to three, then two as Evans couldn't stay with probably the two strongest climbers in this year's Tour. I say probably, because Barolworld's Juan Mauricio Soler, who had taken the lead in the King of the Mountains competition while riding in an early breakaway, was gaining time on Contador and Rasmussen and passing men who had earlier dropped him. Back on the front, Leipheimer somehow scratched his way past Evans and back up to the leaders, and even launched an attack when he got there, but none of the trio wanted to attack as the stage wound down into its last kilometers. Then, with just over 1 kilometer to the summit, Rasmussen put on a yellow-jersey worthy display, dropping the Discos, and riding solo to the summit of the Col d'Aubisque for his second stage win of this Tour and 4th ever. Leipheimer shepherded Contador briefly, then made haste to try to gain some time on Cadel Evans, currently sitting on the bottom step of the podium, where Leipheimer wants to be in Paris. He finished 26 seconds back, and picks up some bonus time, so he now sits 4th overall, :56 behind Evans. Carlos Sastre, who went in a long early breakaway with Soler, takes the most aggressive rider recognition, while Soler takes over the King of the Mountains competition lead. ThePaceline.com (free reg. req.) | Graham Watson: About Face! It was something of a coming-out party for Discovery Channel today, as the team that frequently declares itself the best in the world looked that way for one spectacular stage. Popovych took the red race numbers of most combative rider, after riding in front of the peloton for nearly the entire day. Gusev factored in the early breaks, then Contador launched an assault on the Col du Galibier. Meanwhile, Levi Leipheimer hovered right there with Rasmussen, Valverde, Mayo, and Evans. The team had 3 riders in the day's top 13, and has Contador and Leipheimer sitting in the GC Top 10 tonight. And yet, as always, the Disco boys all point to the Pyrenees as this year's proving ground.